The International Pharmaceutical Federation (FIP) links four million pharmacists and pharmaceutical scientists across the globe. 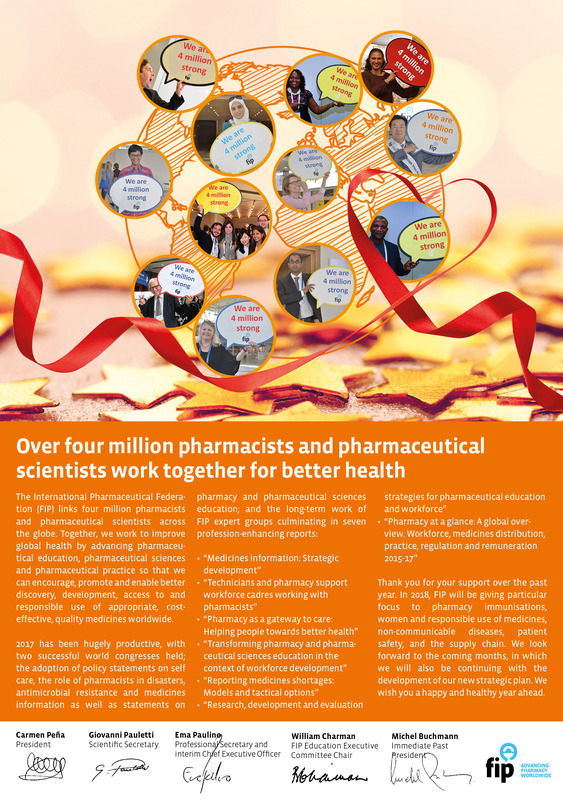 Together, we work to improve global health by advancing pharmaceutical education, pharmaceutical sciences and pharmaceutical practice so that we can encourage, promote and enable better discovery, development, access to and responsible use of appropriate, cost-effective, quality medicines worldwide. Thank you for your support over the past year. In 2018, FIP will be giving particular focus to pharmacy immunisations, women and responsible use of medicines, non-communicable diseases, patient safety, and the supply chain. We look forward to the coming months, in which we will also be continuing with the development of our new strategic plan. We wish you a happy and healthy year ahead.